Chios Societies - Was Columbus Greek? Was Columbus a woolworker from Genoa or a Byzantine Prince and sailor from the island of Chios in what was then the Republic of Genoa? 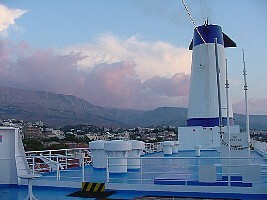 The ferry that sails between the island of Lesvos and Athens port city of Pireaus stops at the island of Chios, a few miles off the coast of Asia Minor. If you are traveling from Athens it arrives at four a.m. and unless you are awakened by the change in the rhythm of the ship's engines as it slows down and backs into the quay you won't even know you have been there. 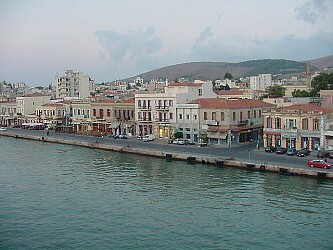 But if you are coming from Lesvos you will usually arrive in Chios at around nine p.m. when the city is in full swing. The ship stays in Chios for an hour, which is enough time to jump off, eat a souvlaki, have a coffee, wander around and look at the shops and perhaps buy some mastiha, the gum that comes from the trees that Chios has been famous for centuries. There is also enough time to stop in to one of the bookstores and buy a small book that may change your mind about the origins of Christopher Columbus, the man who discovered America. The book is called A NEW THEORY CLARIFYING THE IDENTITY OF CHRISTOPHER COLUMBUS: A BYZANTINE PRINCE FROM CHIOS, GREECE. It was written by Ruth G Durlacher-Wolper, the founder and the director of the New World Museum and the New World Foundation in San Salvador, Bahamas, where Columbus' ships first landed in 1492. There has been more written about Christopher Columbus than about any person with the exception of Jesus Christ, and yet his past has been shrouded in mystery. We all have been told that he came from Genoa, a city in Italy and sailed for Isabella and Ferdinand, the king and queen of Spain, after many years of trying to convince them that the world was round, a belief that was uncommon despite the fact that Aristotle had said it over a thousand years before. But most of what we know about Columbus is conjecture and much of his history was written by people who never knew him or had reasons of their own for rewriting or presenting as truth something that was just a theory. 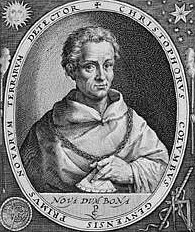 The story of his being the son of a woolworker from Genoa for example only came from the fact that there was someone named Columbus from Genoa who was a wool worker and is a legend attributed to Peter Martyr de Anghiera. Go to Genoa and you will see that there are monuments and a show of pride in it being the birthplace of Columbus. But I am convinced Columbus was from Chios. The book is carefully researched and after reading it even if you are not convinced you will certainly be less sure that all you knew before was the truth. For those of you who remember your Byzantine history, you may recall that the Paleologos Dynasty were the Byzantine Emperors who traced their descendants to the Royal House of David and fled to the west after the fall of Constantinople. According to the book, Columbus and his kinsman Colon-the-Younger came to France with the Paleologi and mixed with the royalty of the period, which would make sense. Why would the King and Queen of Spain give him three ships and a lot of money if he were the son of a Genovese woolworker? Columbus never said he was from Genoa. He said he was from the Republic of Genoa, something much different. The island of Chios was part of the Republic of Genoa. The name Columbus is carved above many doors in the villages of Pirgi and Cimbori and a priest with that last name traces his ancestry on the island back over 600 years. There are also many Genovese families who trace their ancestry back to Chios. Columbus also wrote about the gum-mastic called mastiha, which comes only from Chios. The book presents many convincing arguments and in the end summarizes them with 22 FACTS CONTRIBUTING TO THE CLARIFICATION OF COLUMBUS IDENTITY. Columbus signature "Xro-Ferens" Christophoros is Greek-Latin or Byzantine. Columbus spelled Chios with a Greek 'X'. Columbus named Cape Maysi in Cuba using Greek words, Alpha and Omega. Columbus never asked Italy for ships or aid for food and shelter when he needed help. If he was from Genoa than why not? Nor does he ever mention the Columbo family of Genoa to whom history says he was related. He neither spoke nor read Italian. Yet in his favorite book Imago Mundi by Cardinal Pierre d'Ailly he wrote in the margins in Greek. Columbus was called Genovese because he dressed in Genovese fashion from Chios. He signed his name "Columbus de terra Rubra" which means of the red earth. The Mastic areas of Chios were known for the red color of the earth. He banked at St. George in Genoa, which took care of the colonies like Chios. Columbus kept two logs on his journey, one real and one false. The true log used the measurements in Greek leagues and the false in Roman. The author used the real logs and measurements to reconstruct Columbus discovery of the island of San Salvador and cleared up many discrepancies in the geography of the area. The Colombo family of Genoa was illiterate and the Genovese Christophoro was a wool weaver. For this person to acquire the learning, experience, and spirituality that Columbus had that could convince a foreign king and queen to entrust a small navy and a fortune to him doesn't seem probable. Maybe in twentieth century America a poor son of a common garment worker can grow up to become president but in the Europe of the15th century, it is unlikely he could make Captain, much less Admiral in command of a fleet. It is more likely that for Columbus to have received an audience with a king and queen he would have to be royal himself or have some pretty good connections. 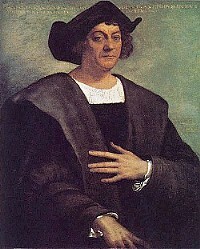 Columbus' son Ferdinand wrote that his ancestors have always followed the sea. Unless the Columbo family of Genoa had a long history of being ships tailors or official shearers of sea-sheep then they were not related. In fact even though they were living in Genoa at the time that Ferdinand was writing about his father, they are not mentioned. Nor are they mentioned in the Will of Columbus. Columbus was not a wool-worker struck by God like Joan of Arc and instantly filled with knowledge of navigation, philosophy, astronomy, psychology, languages and the power to convince kings to give him whatever he wanted. This was a man with a lifetime of education, culture, experience and inspiration who had a sense of his own destiny and the drive to fulfill it. In the book we discover that not only was Columbus connected with the Paleologos family but many of his buddies were Greek too. Perhaps this is the most convincing argument for me. Anyone knowing Greeks in exile is aware that they are a tight group that trust each other and spend all their time together, bound by that thread of Hellenism. As convincing as all the other arguments, (and there are many in this small book), the fact that his 'parea' was Greek, (in other words his group of friends and associates), proved to me that Christopher Columbus was not the son of an itinerant Genovese wool-worker, but a Byzantine prince from Chios who came from a life of enlightened education and spiritual aspirations, and as an islander, combined it with a love of the sea. The islanders from Chios are known for their skill on the sea and for the number of sea captains and ship owners from there. If Columbus was Greek then Chios is the most likely island he would be from. With its Genovese architecture and sea-faring history, the heroic exploits of the people of Chios and also the evidence that Chios was the birthplace of Homer, where else would he be from? Maybe you aren't convinced. But I am. Columbus was Greek.